The list consists of 7 bestselling models with different styles & using purposes: for military men, for divers, for hikers, pilots, etc. This is my favorite model. The Casio Rangeman is among the few digital watches that can reach the balance of attractive design, hi-end features, versatility & reasonable price. It’s not cheap, but compared to what it offers, every penny is worthwhile. What else can you ask for from a timepiece around $200? Besides its impressive features designed for adventures, the Rangeman also has a solid body that exudes manliness. Sized at 55mm, it’s not a big guy in the world of digital watches. But it would look like a tank on your wrist. How it is designed is more important than its actual size. The guarded stainless steel pushers make the watch look even more attractive. The timepiece would look monotonous without some sparkles from these metal buttons. Casio Rangeman is sought-after for many reasons, but this most noticeable is its versatility. It’s designed to survive harshest conditions imaginable. It would make a reliable companion in all your outdoor trips: you can go hiking, hunting, fishing, or even diving with it (it’s a highly waterproof watch, 200m – 660 feet WR). 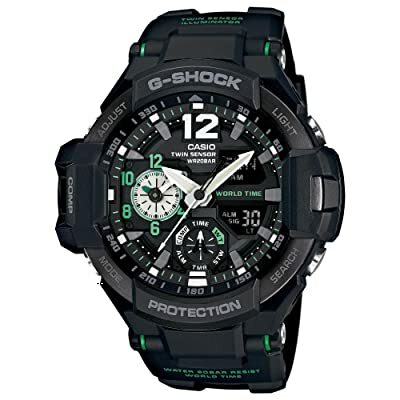 If you want a versatile digital watch for your outdoor adventures, the Casio G-Shock Rangeman makes a perfect choice. Well-protected case, reliable & useful features. tacti-cool design, all you can get at an affordable price. You can’t go wrong with this watch! Exceptionally tough and durable; can survive harshest environments. Special design to prevent dust and mud. Digital compass and stopwatch - useful when on duty. Superb readability in the dark: Neobrite hands and LED backlight. Digital dials are hard to read in the dark. 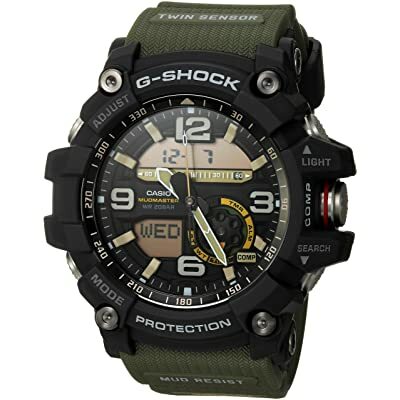 The Casio MudMaster is designed to survive extreme combat conditions which military forces are expected to fight under. The name says it all; the MudMaster has a unique structure that helps it resist mud, dirt more effectively than other tactical watches. Moreover, its ability to resist shock, centrifugal forces & vibration is lifted to a whole new level compared to other G-Shocks. Twin sensor: Digital Compass, Thermometer. These functions help users easily assess natural conditions. World Time: You can check time of 48 different cities, 31 time zones. It’s extremely useful when you are traveling. And what’s so unique is its well-protected body combined with a robust quartz movement which is shock & vibration resistant. This combination helps the Mudmaster survive the harshest combat conditions imaginable. It’s hard to make an extremely tough watch with a small case covering all the vulnerable parts inside, so you should expect the Mudmaster to be larger than usual. It’s 56.5mm wide & 18mm thick, indeed not designed for small wrist folks. The big case also provides a smooth operation that is vital to combat situations. You can read time at a glance thanks to big hands; you can push the buttons quickly thanks to the big case. With the Mudmaster, Casio took everything to a whole new level. Better shock resistance, better vibration resistance, better dust & mud resistance! That’s not all; the badass design also helps servicemen feel more confident to accomplish their missions. This is not a cheap watch, of course, because it has so many cool things. But you can go wrong with the Mudmaster; it’s worth every penny you pay for! Digital dial is hard to read at night. 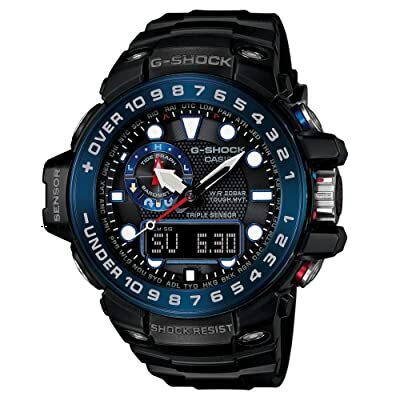 The GA 100-1A1 is a standard G Shock watch which offers you all basic features at an affordable price. It’s become one of the most popular models in the series for this reason. To be honest, it has nothing special from the inside out as it’s not made to be the next bad boy of the series. Instead, its biggest plus is reliability. It’s not designed to survive extreme conditions; it doesn’t have many hi-end features for outdoor trips. A police rarely needs these things when on duty. Sized at 55mm, it falls into the average group of digital watches. The resin case is simple but eye-catching. It’s worth noting that the watch may look much different in other colors, Casio offers you this model with a wide range of color choices. From khaki & camouflage to standard colors like red, white, black. What’s not to love about this watch is the back LED light, it can’t light up all the dial, so sometimes it’s a little tricky to read time in the dark. The GA100 is not the most hi-end, the toughest, the most beautiful piece in the G-Shock series. But it’s still the bestselling model for a simple reason – its harmonious combination of all aspects: simple rugged look, reliable standard features, affordable price. A good start to aviation watches. Hand shift feature – you can move the hands to see the digital dials. World time function – for international pilots. Distinctive design: rugged yet elegant. Auto light switch – convenient in low light conditions. Digital windows are quite small. The GA-1100 is not the latest version of Casio Gravity Master. The newest model now is the GPW2000 with lots of cool hi-end features, such as Bluetooth & GPS tracking, Latitude / longitude display, Twin Sensor (Digital Compass, Thermometer), Flight Log function, etc. The design is also sharper with more metallic accents. Both are awesome watches, but I chose to review the older version because the new one costs about four times its predecessor. Whether the new functions are worth this extra money? It’s still a controversial topic among G-Shock fans. So I want to bring the safer choice to you – the GA-1100. Different from most G-Shock watches, the GA-1100 is an all analog timepiece because it’s designed for pilots who need to scan time at a glance. The big hands & hour markers are luminescent for superb readability in the dark. The main dial is crowded with four subdials needed for aviation functions. World Time is also a vital function of pilot watches, so this Gravity Master has 31 time zones (48 cities + coordinated universal time). Along with those special features for an aviation watch. 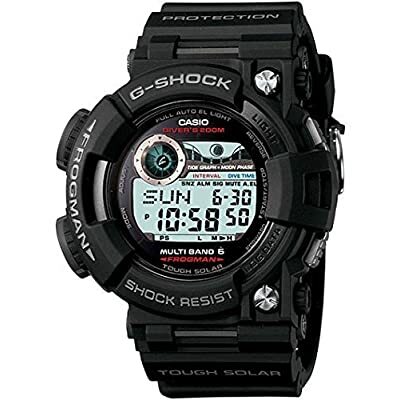 It also fulfills the checklist of a standard G-Shock like Triple 10 Resistance, 200m Water Resistance, 1/100 Stopwatch, Timer. The Twin Sensor offers you reliable Digital Compass & Thermometer. 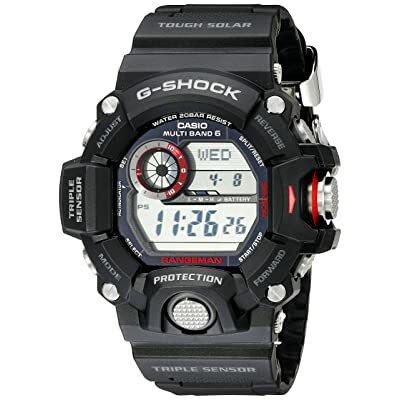 The case is just 52mm, rather elegant compared to other G-Shocks. The sharp look is what I like most about its design. You don’t have to be a big boy to look cool! Along with special features for aviators, this Gravity Master GA-1100 has an eye-catching design, too. Its affordable price makes it easier for you to try out if this is the first time you buy a pilot watch. If you’re interested in the newest GPW2000 model, here’s the link to take a look, it much more expensive, but this is because it brings a lot of hi-end stuff on the table. Two GravityMaster watches fill two different market segment! We can’t compare them directly! Make clear what you want from your watch so that you won’t go wrong with your purchase! Metal case makes it more versatile than most G-shock watches. World – time function, 31 time zones, no need to adjust the time as you travel. Solar – powered battery, convenient when you’re on the go. The metal dial is more prone to scratches. Quite big for some people. 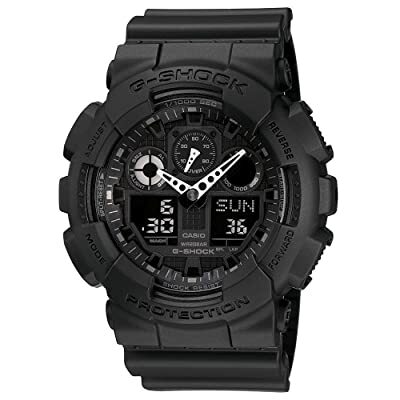 The most common complaint from non-G-Shock users is that the all resin body looks so monotonous. Again, it’s a matter of taste. These resin watches are among the bestselling pieces in the watch market today. But it’s not the reason for Casio to ignore feedback from its prospects who admire the G-Shock’s technology but don’t like the style. So the G-Shock Generation 2, aka G-Steel was born, to fill out this gap in the watch market. Despite having a stainless steel face, the G-Shock 2 still has the same shock-resistant ability to its predecessors, thanks to its Layer Guard Structure. What I like most about this watch is its sharp metal case. The brushed surface finishing makes it look dressy but not flashy. 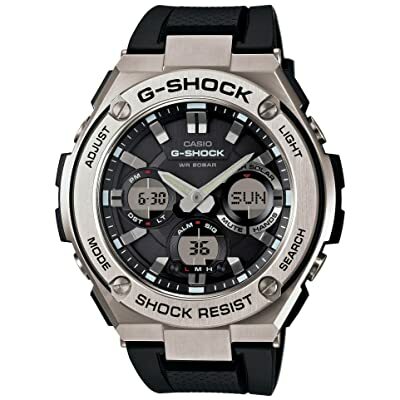 The G Steel is available on rubber band and metal band, both are fantastic, but I prefer the rubber band version, because, in my opinion, the G-Steel was designed not to be monotonous like the old G-Shocks, so why changing from all-black to all-silver? The black from rubber band and the silver tone from the metal case blend in very well with each other. With the new design, the G-Steel is easier to go with more types of clothing. It’s not a dress watch, but you can dress it up a bit. That’s why I think it’s most suitable for travelers who need a-watch-for-everything. This is a Tough Solar watch which is made to operate normally six months after a full charge. But you don’t have to worry about energy because each time you go outside, the watch is charging the battery itself. By choosing the G-Steel GST-S110-1ACR, you get the best of both worlds: the durability & toughness of a G-Shock, and a dressy look of a normal metal watch. Combine these two aspects in a single watch is not easy for Casio, but they did it! Compliant to ISO 200 Water resistant. Bright LED light to read time underwater. Long lasting solar powered battery (8 months); little time to charge. Multi-Band 6 Atomic Timekeeping to update accurate time. Hard to choose outfits to go with. The name says it all! Casio Frogman is a pro diver’s watch. That means it has to pass the all the criteria of ISO 6425 standard for dive watches. Every single product must be tested! It’s not just a waterproof watch; the Frogman is designed to operate well under deep water for long hours. The pushers can be used at high depth. Most waterproof watch can operate underwater to an extend until you push something on it and water soaks inside. And a lot more requirements, so you can expect the Frogman not to be cheap! The Frogman available now in the market is the 6th generation which as many improvements compared to its predecessors. You can read here for more information! Sized at 58mm (bezel included), this is not a small watch by any means. All the case is made of DLC-coated Stainless-steel to increase abrasion resistance underwater. Frequently used pushers are arranged on the left to advoid interference with the back of your hand. They are quite big, so you can easily operate them with your thumb. As a diver’s watch, the Casio Frogman looks best with a scuba diving suit. So cool! However, you can also use it as a casual or outdoor watch on land. Its robust appearance fits in well with most tactical outfits! This watch is designed for pro divers who would use it as a primary diving tool. However, it can also make an excellent outdoor watch on land! The price of this watch is higher than most other G-Shock, but since it’s hi-end features are unique, we can’t compare them to each other! Barometer can predict weather changes. Tide graph helps anticipate sea surface conditions. Digital compass for direction on the open sea. Low- temperature resistant, can withstand rough weather conditions. Another G-Shock designed for men of the sea. But unlike the Casio Frogman, this GulfMasterGWN-1000B focuses more on marine activities rather than scuba diving. If the Casio Rangeman is a versatile watch for adventurers on land, then this GulfMaster is the marine version. As many other G-Shocks, you can go diving with this GulfMaster, but it’s not professionally designed for this purpose, so do it at your own risk! It’s worth noting that the design is inspired by shipboard instruments. This makes it one of the most beautiful G-Shocks in the whole series. The case diameter is 55m, but the watch looks quite elegant compared to its actual size. I think it’s the slightly sloped bezel that makes it look smaller. I can sense the style of a traditional analog diver’s watch on the dial. Classic and modern style in one single timepiece. Sounds interesting, huh? Regarding functions, the Casio GulfMaster is versatile maritime watch which would be a reliable companion in your adventures to rough seas. Regarding style, it’s a perfect combination of a classic dive watch with a modern outdoor watch. Its dial design, which takes inspiration from shipboard instruments, is also a reason for winning many hearts of G-Shock fans.